If it’s true that everyone has a book in them then, “Writing for Bliss: A Seven-Step Plan for Telling Your Story and Transforming Your Life” by Diana Raab, is an essential volume to help one dig deep within to nourish and that cultivate that story. The author brings an abundance of wisdom and experience about writing for healing and transformation to “Writing for Bliss,” and guides the reader step-by-step. So much more than a ‘how-to’ book about writing, although it is that as well, the focus is on writing from within, and how to bring your own story into existence in ways that can heal and transform. The author provides tips, writing prompts and techniques that writers in all stages of their journey will find helpful. I have never given a lot of thought to writing my own story, convinced I don’t have much of a story to tell. Intimidated by the blank page and the ‘write what you know’ axiom, I was pleasantly surprised with the steps recommended by the author to overcome whatever holds your story inside. Tips such as keeping an open mind, and practicing patience when writing about emotions and experiences, are suggested as ways to give oneself permission to let go and just see what happens. That permission to explore, something one intuitively knows is available, but often not allowed to surface, could be the key to clearing the boulder blocking one’s path. Raab’s steps on Cultivating Self-Awareness (Step Two), Speaking Your Truth (Step Three), and Examining Your Life (Step Four) are enlightening, insightful, and easy to follow. The other steps prepare you for writing and finding your form. There is also a step on writing poetry and the final step provides constructive information about sharing your writing with others. “Writing for Bliss” is an intimate journey with the author, who uses a heart-and-soul approach to reaching her readers. As she shares her own experiences, one will often feel as though she is right there in the room. 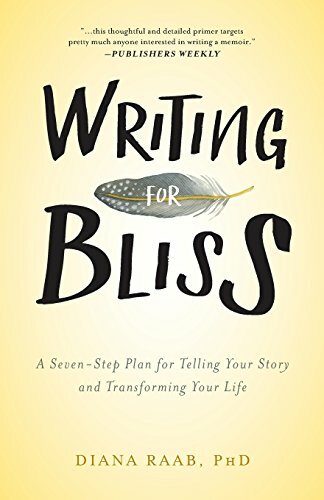 I highly recommend “Writing for Bliss” by Diana Raab to new writers needing a bit of inspiration to tell their story and to experienced writers as an indispensable reference.